Humans are biologically wired to be lazy, a Canadian study suggests. 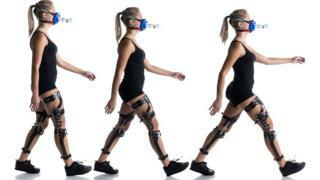 Researchers asked nine volunteers to wear leg braces that made walking at their usual pace more strenuous. Within minutes, each volunteer worked out how to modify their usual walking pattern to use the least energy. And despite changing walking habits that may have formed over a long time, researchers say, in some cases the energy savings made were very small - "the calorific equivalent of peanuts". Researchers from the Simon Fraser University in Canada say when left to its own devices, the subconscious nervous system continuously fine-tunes movements to keep energy costs low. And they say their findings, published in Current Biology, fit in well with the common tendency to put as little effort into tasks as possible. Dr Max Donelan said: "Here we have provided a physiological basis for this laziness by demonstrating that even within a well-rehearsed movement like walking, the nervous system subconsciously monitors energy use and continuously re-optimises movement patterns in a constant quest to move as cheaply as possible." And even when people choose to go for a run, researchers say, their brains are hard at work in the background making it as efficient as possible. Dr Donelan added: "This is bad news for those of us who eat too much." More work is needed to expand this early research and in particular to understand how the body's thousands of muscle-nerve units work together to achieve this feat, the researchers say.